It’s a much-loved classic that introduces a whole new era of Doctor Who: Spearhead from Space. 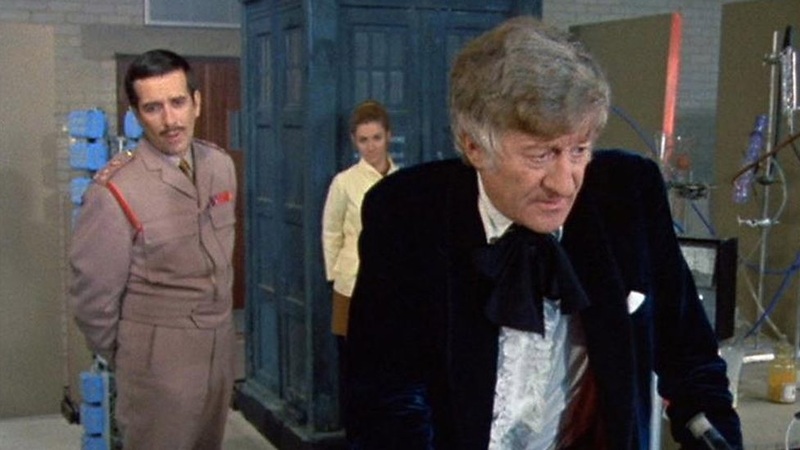 Jon Pertwee makes his debut as the Third Doctor, an Earth-tied Time Lord; UNIT is reintroduced as a regular mainstay of the show, including Nicholas Courtney’s Brigadier and Caroline John’s Liz Shaw; and it’s arguably when writer, Robert Holmes proved his potential. Because this is Doctor Who in a familiar 1970s landscape, it gives us a good picture of the society from which it’s born: fresh from the swinging sixties and ready to embrace flashy boots, ponchos, and the Midi skirt. Oh, and plastic. Definitely plastic. 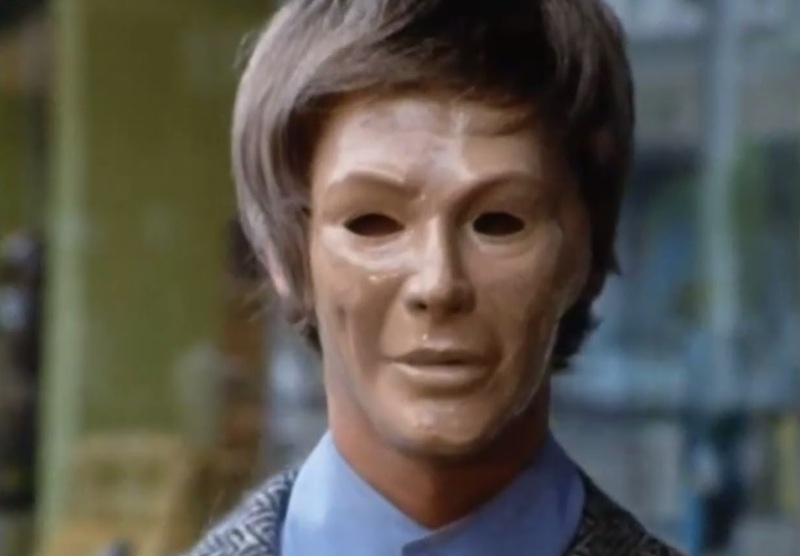 The Autons remain a horrific but brilliant notion. The Nestene Consciousness is an alien with the peculiar ability to manipulate and give life to plastic, especially strange considering the creature’s biological, squid-like appearance. The two seem at odds, their opposition highlighted by media coverage of the harm done by plastics on the environment. Robert Holmes’ tale of plastics taking over the planet seems very prescient. Considering how environmentally-aware the production team of the Third Doctor era would prove to be, it’s certainly believable that Spearhead from Space is a warning about commercialisation and toxicity. Or equally likely, Holmes thought it would simply be great television. Doomwatch ran between 1970 and 1972, and was created by Kit Pedler and Gerry Davis (whose names will forever be linked to the Cybermen). 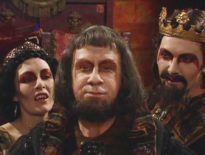 Its first episode, broadcast on 9th February 1970, in fact threw the lever in the opposite direction: The Plastic Eaters saw a man-made virus melting plastic components, resulting in a plane dissolving in mid-air. Plastic’s usefulness became apparent during the Second World War, and its domestication soon followed. By 1960, plastic became one of the largest industries in the UK, thanks to products like disposable pens, Tupperware, and, yes, mannequins. Today’s mannequins can definitely seem horrific – remember the Marks & Spencer ones with massive mouths? The stuff of nightmares – but those used in the 1960s and 1970s also had a creepy feel to them. Humanoid figures, and by extension dolls and dummies, spark off automatonophobia, more specifically pediophobia. Coincidentally, Spearhead from Space aired at an incredibly apt time. In an obscure Japanese journal called Essay, Tokyo Institute of Technology’s Masahiro Mori published his exploration of the ‘uncanny valley,’ people’s negative reaction to anything that looks and acts like us, but there’s something inexplicably wrong about it. From the off, shop-window dummies had familiar elements just slightly removed from humanity. Around the turn of the 20th Century, the 300-pound mannequin was made from iron, wood, and wax, topped by false teeth, glass eyes, and real hair. In the subsequent decades, mannequins became slightly more realistic, a metal frame covered with skin-like material replacing more cumbersome components with individual features added to give a sense of personality. Some were even based on stars like Josephine Baker, Marlene Deitrich, and Greta Garbo. 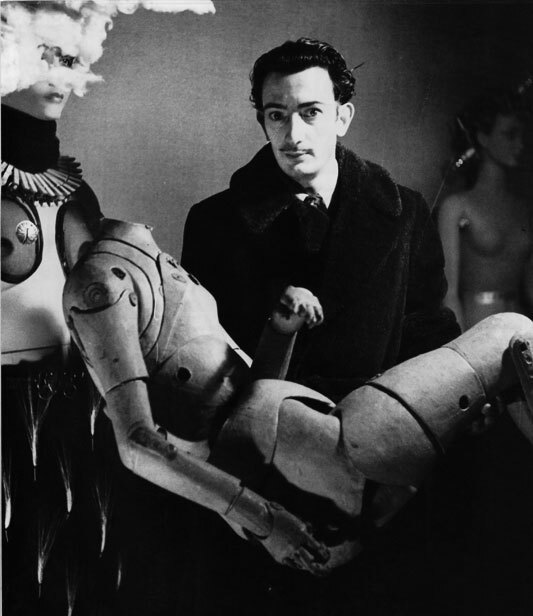 Surrealist, Salvadore Dali created a chilling window display for a New York department store in 1939: it showed disembodied hands emerging from a blackened bathtub, each holding mirrors. A 1890s wax dummy, clad only in feathers and a wig teeming with fake insects, inspects her reflection, blood-red tears streaming down her cheeks. Exposing the world to its own vanities didn’t go down too well, and after complaints from the public, it was soon taken down. Shortly after, mannequins were made of plastic, and then, in the 1960s, fibreglass. 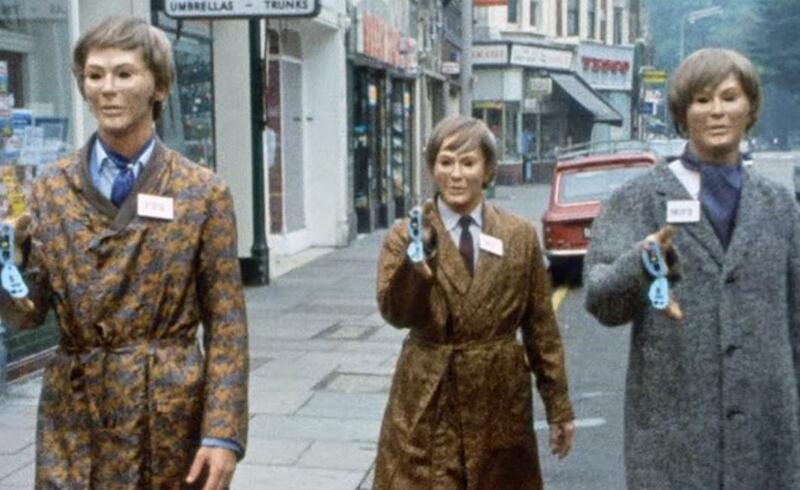 At a time when mannequins were modelled after the likes of Twiggy and adorned with bright clothing, you’d expect the Autons in Spearhead from Space to be suitably attired. It’s ironic, then, that Doctor Who‘s first colour adventure looks relatively drab. Viewers were familiar with the Daleks in all their multi-coloured glory with the two movies – Dr Who and the Daleks and Daleks’ Invasion Earth 2150 AD – starring Peter Cushing released in 1965 and 1966 respectively. In 1966, the BBC also announced plans to broadcast in colour the following year, just in time for BBC2’s coverage of Wimbledon, which began on 1st July 1967. Western Europe adopted the Phase Alternation Line (PAL) colour-encoding system, which worked at 50 frames per second and at a higher resolution than the National Television System Committee (NTSC) standard used stateside. Bringing colour television to the masses was planned in the 1950s, but the PAL format wasn’t patented until 1962, having been invented by Walter Bruch in Hannover, Germany. David Attenborough, controller of BBC2 1965- 73, oversaw the transition to colour, which was initially expected to have cost the corporation “between £1m and £2m per year, for an initial four hours of television per week on BBC2, rising to 10 hours a week after 12 months.” By mid-1968, the vast majority of BBC2 programmes were in colour, and BBC1 followed six months later. Despite a colour receiver costing around £250, it proved hugely popular; by the early 1970s, 12 million people in the UK had a colour TV license. In 1970, for anyone watching on a new colour television, Spearhead from Space must’ve looked stunning. Viewers today can experience it like never before. It’s the only Classic Who serial to be released on Blu-ray, and it’s one of the only ones that can be regardless. In fact, it might be the sole one. Due to industrial action by videocamera operators, the four-part story was shot on-location – by film camera operators who were part of a different union – and entirely on 16mm cameras instead of the typical videotapes, although other adventures feature significant segments also on 16mm format (named literally because of the film’s width). A full 16mm print of Doctor Who‘s Pilot episode was recovered in 1978; in fact, apart from the missing serials and five 35mm recordings, almost every story until 1972 that survives as telerecordings (not a master copy) is on 16mm format. Spearhead from Space reflected a society the audience could relate to. This was Doctor Who at its relevant best. But that doesn’t mean it doesn’t stand the test of time. Directed by Derek Martinus and produced by Derrick Sherwin (and uncredited, Barry Letts), this much-loved tale deserves its status as a bonafide classic. Spearhead from Space is available on DVD and Blu-ray – numerous times! 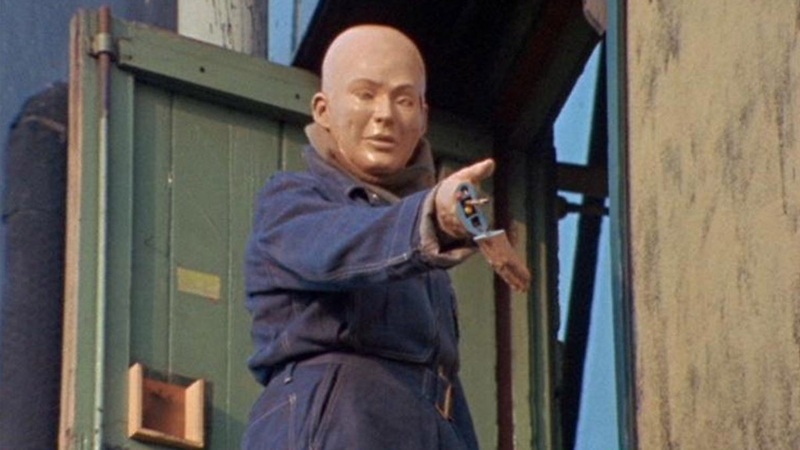 The Blu-ray is shockingly cheap , or you may prefer the Mannequin Mania DVD set , combining the Autons’ debut with Terror of the Autons. If you’re not keen on their second story, you could just get Spearhead itself on DVD . ← Reviewed: The Diary of River Song Series One!